Viewed from a distance, most wood interior passage doors and wood exterior doors look like they are made of solid wood. But more often than not, these doors are clever imitations, using construction methods designed to make them look like solid wood while avoiding some of the drawbacks. Solid wood doors are generally considered the premium choice, but there are many factors to consider. You may well find that solid wood doors are not always the best choice for you. Wood doors used in residential construction come in three types: solid wood, hollow core, and solid core. Solid wood doors are, as the name implies, made of either a solid wood slab or a frame-and-panel construction that uses natural wood—whether a softwood like pine or a hardwood like oak or maple. Exterior doors made from wood typically use solid wood construction for strength and security. With interior doors, however, you have other options. Hollow-core doors are constructed with a thin veneer of high-quality wood applied over a core of honeycombed cardboard or plastic. Hollow-core doors are cost-saving products often used for the many interior passage doors found in a house. Solid-core doors represent an interim construction method, in which a fine-grade surface wood veneer is glued over a solid core made of engineered wood, such as MDF or Masonite. Solid-core wood doors can be used for either exterior or interior doors. Each type of door has its own advantages and disadvantages, and choosing a door type involves weighing the importance of the various factors. Solid wood doors are 100% natural wood, except for the hardware or accessories. Before 1949, the Uniform Building Code (now called the International Building Code or IBC) mandated that solid wood doors be solid, unified slabs of wood. That changed as it became harder to log the big timbers needed for single-slab doors. Solid wood doors are now more often built with a frame-and-panel construction. The classic wood panel door looks and feels like one piece of wood, though it is not. The six panel door has been around for ages and is constructed of individual panels, mullions, stiles, and rails that hold floating panels. When stained or painted, a wood panel door looks like a solid slab of wood that has been shaped with decorative contours. Solid wood doors have a very solid, substantial feel and are very strong. Sound-blockage is good to excellent, depending on wood species. Softwoods like pine are not very sound-proof, but hardwoods such as oak and maple are excellent at blocking sound transmission between rooms. Fire-resistance is fairly good with doors that are 1.75 inches thick or more. Solid wood doors are good for maintaining the resale value of a home. These can be very expensive doors, especially those made from quality hardwoods. Humidity changes can cause expansion, contraction, and warping. Solid wood doors can be used both for both interior and exterior doors. When used for exteriors, wood must be finished or painted. 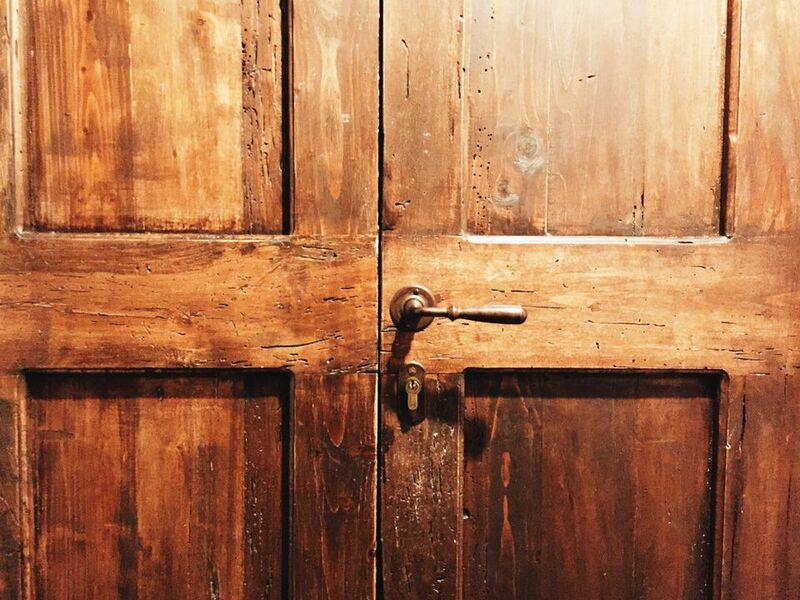 Solid wood doors are a good choice where historical authenticity is desired. Most production houses built today receive hollow core interior doors as a matter of course. Inexpensive and lightweight, they are easy to install and can save thousands of dollars on construction costs, since a typical house may have a dozen or more interior doors. To call these doors hollow is somewhat misleading since they do have a honeycombed core placed within a solid wood outer frame, over which the surface veneer is glued. The frame and honeycomb core provides some rigidity to the door, as well as minimal sound-blocking ability. Hollow-core doors are the least expensive. Veneer construction makes these doors fairly stable in changing humidity levels. DIY installation is quite easy. These are very light-weight doors, and they may feel cheap. Hollow-core construction is rather poor at blocking sound. These doors offer little in the way of fire resistance. Hollow-core doors are best used for interior doors in situations where you need to save money on construction costs. Solid-core wood doors are constructed with quality wood veneers glued over a solid core of engineered or composite wood, giving them the primary virtues of both solid wood and hollow-core doors: they are relatively affordable yet quite sturdy and solid in feel. Because of the high density of engineered wood, these doors may actually be heavier and stronger than some solid wood doors. Some solid-core doors intended to look like painted wood use no surface veneer at all—they are solid slabs of MDF or another engineered wood, shaped and molded to give the appearance of a painted frame-and-panel door. These medium-priced doors are considerably more affordable than solid wood. Solid-core doors offer good fire resistance when they are at least 1.75 inches thick. Construction makes them resistant to expansion and contraction due to humidity changes. Style options are somewhat limited when compared to solid wood doors. These are not DIY-friendly doors—the heavyweight means that two people are mandatory for installation. Solid-core doors are a good affordable option wherever solid wood interior doors are called for. Solid-core doors are usually not suitable for use as exterior doors.